Over the course of the next few weeks, we want to do a little something like an ongoing book discussion. Each week or so, whatever our free time is allowing us, we focus on one or two chapters.The book in question is called „Getting started with Transmedia Storytelling: a practical guide for beginners“ by Robert Pratten. It basically consists out of 10 chapters. We want to start with the introduction, answering basic questions concerning the nature of transmedia and storytelling: What are both those things? What are they combined? Why would you even want to combine them? Before we do all that, let us take a closer look to the author. Robert Pratten is the founder and CEO of Transmedia Storyteller Ltd. So why is that important? Because Transmedia Storyteller Ltd. are the creators of ‚conducttr‘ , „The platform for real- life immersive experiences“. Conducttr describes itself as an „pervasive entertainment platform“, allowing the user to interact with his favorite characters on an intensified level, even making it possible to make up a complete new story. Furthermore, Pratten has written two films, London Vodoo (2004) and Mindflesh (2008), both critically acclaimed. To the day, Pratten counts as one of the most influential professionals in the world of transmedia storytelling. Some of his clients are no less than Disney, Endemol, Toyota or MindLab. So now that we know the mastermind behind the book, let us focus on the first chapter and basic questions such as ‚what is transmedia?‘ and ‚why transmedia?‘. The two figures show the most important aspect regarding ‚why transmedia?‘. 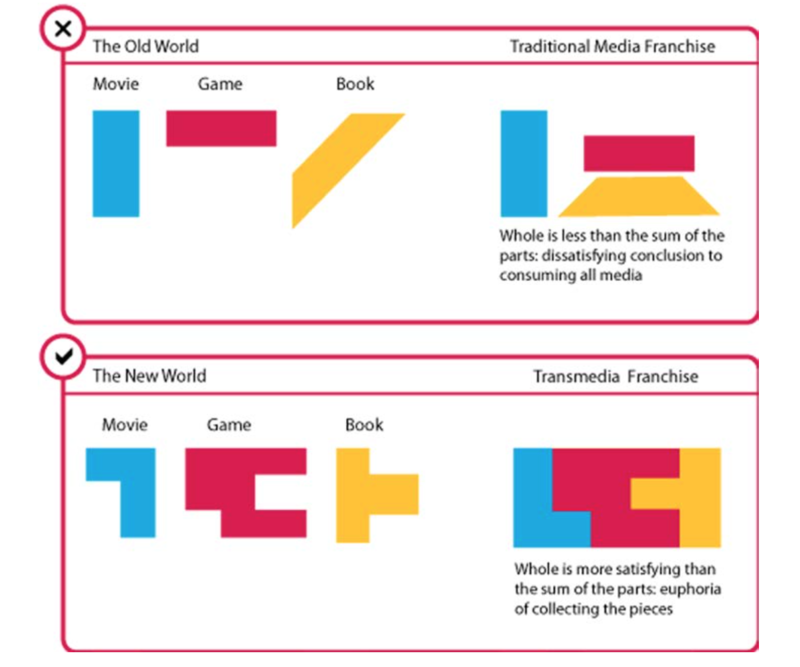 While the different channels and platforms in the ‚Old World‘ do not connect with each other, therefore providing the user singled out experiences with no link between them, transmedia storytelling does exactly that: By telling one big story with three platforms instead of telling three small stories on three platforms, the user becomes more invested in the whole project and is more likely to develop the urge to be up to date. Pretty standard and pretty accurate. By using more than one platform (Youtube, Soundcloud, the Cinema, branded websites), you allow the participant to interact with the story on more than one level, therefore experiencing an intensified and deeper understanding of the plot and the characters. Regarding the traditional definition, Pratten states: „The problem with the traditional definition is that it is focuses on the how of transmedia storytelling and not the why – it describes the production and not the consumption“. „Taking the audience on an emotional journey that goes from moment-to-moment“ is an alternate proposal Pratten uses to make the audience the center of the definition. A „moment“ is, in his words, „a point in time when we are totally absorbed in the present“. He calls Transmedia Storytelling a „design philosophy“. I want to close this first article about Prattens’ book with an example he uses to underline the importance of storytelling. It is the story of ‚Significant Objects‘ . The team from significant objects bought obvious junk from ebay for a total of under 130$, not spending more on one item than 1 to 3$. After doing that, they re-listed the items and added a story, resulting in a massive profit. Within the next week we will publish a follow up article concerning the review of Robert Prattens Book. Focused on understanding Transmedia Storytelling. This article is contributed by Jamin Schneider.